Endovascular surgery is a form of minimally invasive surgery that was designed to access many regions of the body via major blood vessels. Endovascular techniques were originally designed for diagnostic purposes. Basic techniques involve the introduction of a catheter percutaneously or through the skin, into a large blood vessel. Typically the blood vessel chosen is the femoral artery or artery found near the groin. Access to the femoral artery for example, is required for peripheral, carotid, and aortic angiographic procedures. Alternative routes for entering the arterial circulation include the radial or brachial artery in the arm or the pedal artery in the foot. The catheter is injected with a radio-opaque dye that can be seen on live X-ray or fluoroscopy. 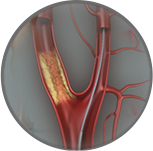 As the dye courses through the blood vessels, characteristic images are seen by the endovascular surgeon and can assist in the diagnosis of diseases such as atherosclerosis, peripheral vascular disease, carotid artery disease, or aneurysms such as abdominal aortic aneurysms (AAA). In recent years, however, the development of intravascular sheaths, wires, catheters, balloons, stents and stentgrafts have allowed for new therapies as alternatives to traditional surgeries such as peripheral bypass surgery, carotid endarterectomy and open abdominal or thoracic aortic aneurysm repair. Stents are composed of fine wire materials such as nitinol, which can be inserted through a thin catheter and expanded into a predetermined shape once they are guided into place. 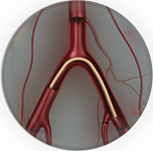 Endovascular surgery is utilised by Specialist Vascular Clinic to offer the latest in minimally invasive techniques. The field is rapidly growing as these minimally invasive techniques offer an immediate advantage over more traditional, yet highly invasive surgeries. The most common and advanced form of endovascular surgery taking place today is an endovascular repair of aortic aneurysms and dissections. This is a new technique developed to treat aortic aneurysms and dissections by use of stentgrafts which are inserted into the vasculature via the femoral arteries in the groin. Specialist Vascular Clinic is one of a few centres around the world able to offer patients a pure endovascular repair for complex aortic diseases such as juxtarenal, suprarenal, thoracoabdominal and aortic arch aneurysms. These complex aortic pathologies require a more specialised level of surgery which is ideally offered by surgeons who have undertaken subspecialty training in this area of vascular and endovascular surgery. Figure 1 demonstrates 3D CT scan reconstructed images of a patient with a complex abdominal aortic aneurysm and severe right renal artery stenosis and moderate stenosis of the superior mesenteric artery (SMA) and coeliac artery. The patient was a 79 years old female with severe cardiac disease and not considered a good candidate for open repair. She was also not considered a good endovascular candidate for a standard type of endovascular repair due to anatomical considerations. She was successfully treated by using a custom-made fenestrated aortic stentgraft (Cook Medical) with branches to the renal arteries and the SMA. The procedural time was 2.5 hours, the aneurysm was excluded successfully and the renal and mesenteric vessel stenoses were resolved. There is excellent filling of both internal and external iliac arteries bilaterally as well as the renal and mesenteric circulations. The patient was discharged from hospital on post-operative day 3 and remains well in follow up. Specialist Vascular Clinic is also one of a few centres in Australia able to offer patients an endovascular Laser for arterial lesions. This technique of excimer laser ablation is used in the treatment of patients with peripheral vascular disease. This cool laser transmits short bursts of "cool" ultraviolet energy through the catheter to penetrate and vaporize blockages and plaque inside the peripheral arteries. This procedure has been particularly useful in patients with critical limb ischaemia (leg ulcers or foot pain or gangrene) to prevent amputation of the leg as well as for patients who have re-narrowing inside previously placed stents (in-stent restenosis). Figure 2 reveals the angiographic findings of SFA stent and popliteal artery occlusion in an elderly gentleman with ischaemic rest pain in the foot and dusky discolouration of the toes. 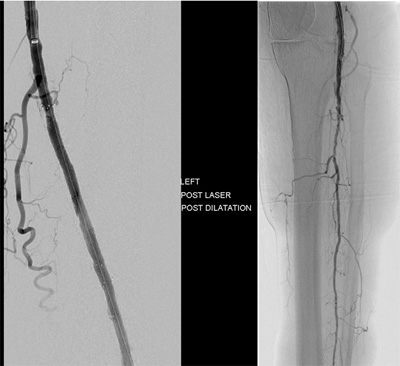 Figure 3 demonstrates the completion angiogram of the same patient as in Figure 2 after successful treatment with laser and then balloon angioplasty. There was complete resolution of the foot pain and discolouration and the patient has been able to avoid amputation. 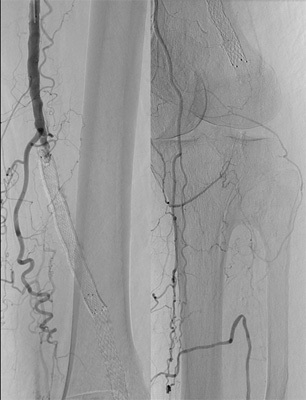 Endovascular techniques are also being applied to venous diseases. At Specialist Vascular Clinic we offer patients a simple, effective Laser solution to eliminating varicose veins. EVL or endovenous laser is an innovative procedure that is performed at the doctor's rooms and is a faster, more effective and less painful alternative to traditional open surgical vein stripping. The procedure is performed under ultrasound guidance where the great saphenous vein is identified and then entered percutaneously under local anaesthesia. Using a guide wire a sheath is inserted into the vein and a laser fiber is introduced. After instilling 'tumescent' local anaesthesia into the tissues surrounding the vein the laser fiber is activated and slowly withdrawn from the vein. Under ultrasound the vein is seen to immediately contract and close off, thereby no longer able to reflux blood back down into the affected leg. At Specialist Vascular Clinic we offer patients a range of therapies for the treatment of varicose veins from microsclerotherapy to endovenous laser ablation to open surgical treatment options. We are able to offer all the possible treatment alternatives and help the patient to select which is the most appropriate for each individual. 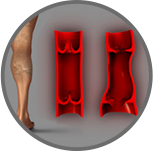 Contact Specialist Vascular Clinic to make an appointment to be seen by a specialist. Tel: (02) 94391110 or request an appointment online.